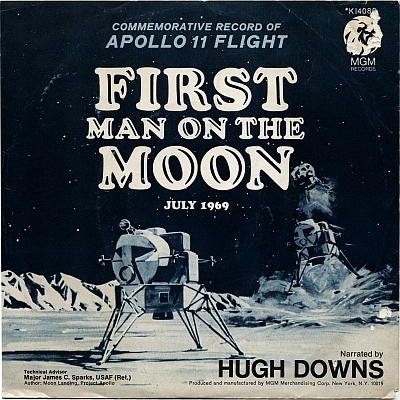 On July 20, 1969, two guys in a tiny tin bug did what dreamers have dreamed since they saw that gray orb in the sky. Landed and walked on the moon. 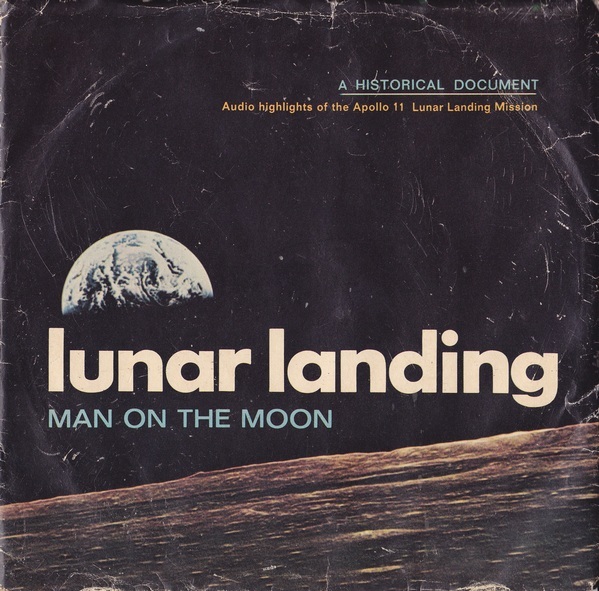 The most challenging project in our brief human history cummulated when Neil Armstrong and Buzz Aldrin landed their tiny Lunar Module in The Sea Of Tranquilty, some 250,000 miles from home, our little blue & green terra firma. 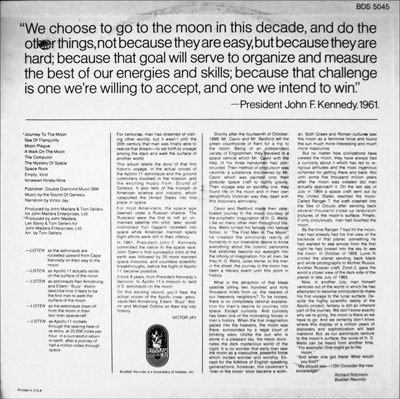 In 1961, President Kennedy had challenged us to complete this adventure before the decade had expired. Thousands of people worked together and, overcoming accidents and errors, beat that deadline by four months. 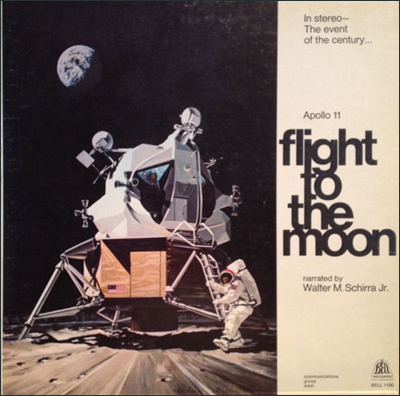 Later in the 70s, the moon journeys became almost routine (except for Apollo 13) and the public lost interest. 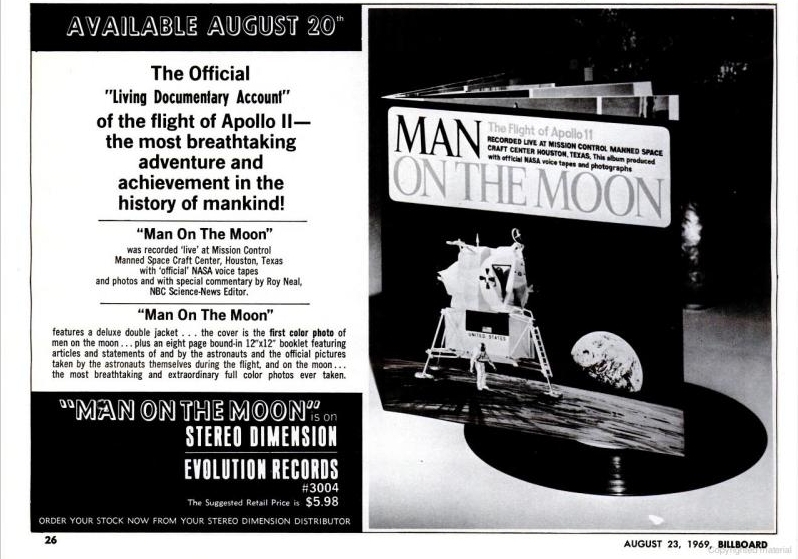 Many politicians demanded that we stop wasting money on these flights and the Apollo project was terminated. In reality, the budget for NASA (since the space race) has always been around 1% of the federal budget, more than paying back that cost with innovations that we take for granted in our every day lives. Imagine how far into outer space we'd be by now if we stopped wasting money (and lives) on wars of (poor) choice. OK, I'll get off my soap box now. 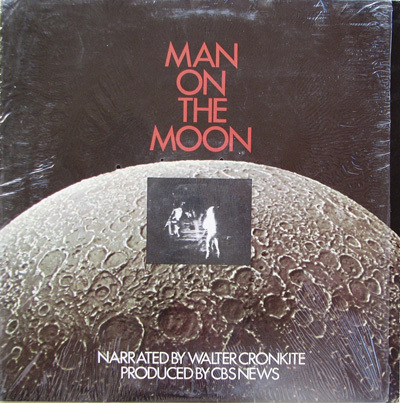 While we watched toungue-tied Walter describing the events on CBS, ABC had Duke Ellington performed live a piece called "Moon Maiden." 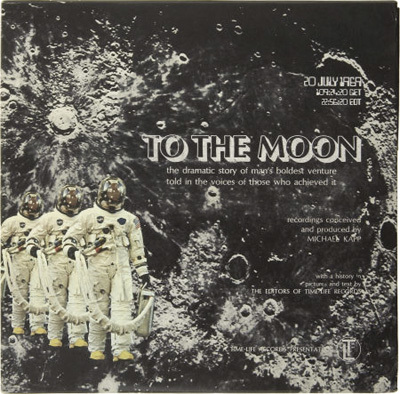 In Central Park, 10,000 folks gathered at "The Moon Site," where a giant screen showed the action (along with Sc-Fi clips) whilst Silver Apples performed "Mune Toon." Meanwhile, across the pond, the BBC invited Pink Floyd to appear on a BBC1 TV Omnibus show called So What If It's Just Green Cheese?. The Floyd jammed on a ditty called Moonhead •. 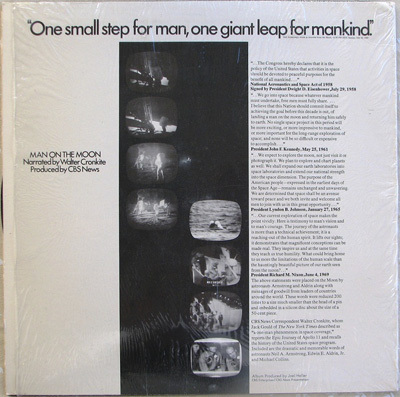 John Phillips (Mamas & Papas) was so inspired by the landing that he spent several years trying to mount a musical about an astronaut sent to the moon to defuse a bomb that could spell the end of earth! Yup, that took awhile to accomplish, what with three directors, a singer who couldn't, and numerous rewrites. The Andy Warhol produced off-Broadway effort lasted five days. Interesting story. 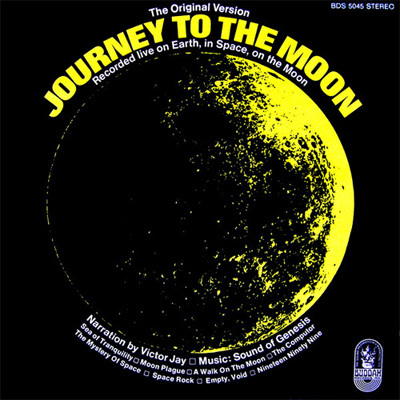 In the days and months following that first moon landing, many commemerative records were released documenting the journey to the moon. 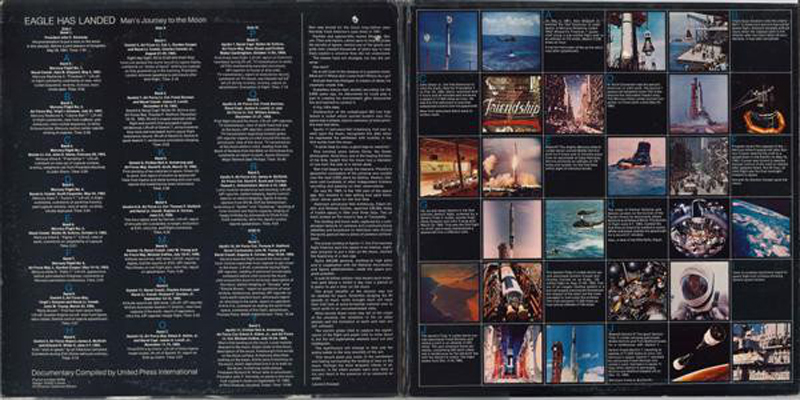 There were also some "topical" singles released and they are listed here as well as a few isolated tracks from then-current albums. 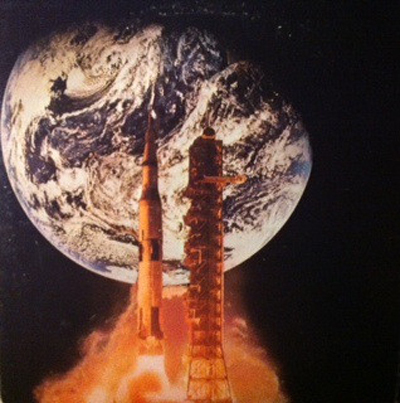 Not everybody was in love with going to the moon: Gil Scott-Heron and Clay Tyson. 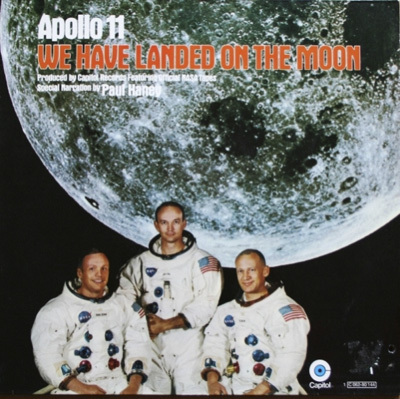 Buzz Aldrin made a music video in 2009 (produced by Snoop Dog!) called Rocket Experience. But don't tell Buzz he didn't land on the moon, or you'll get smacked! Note: Also released as an 33 RPM single. 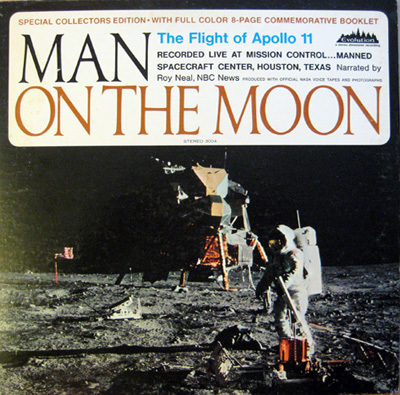 Recorded live on earth, in space, on the moon. 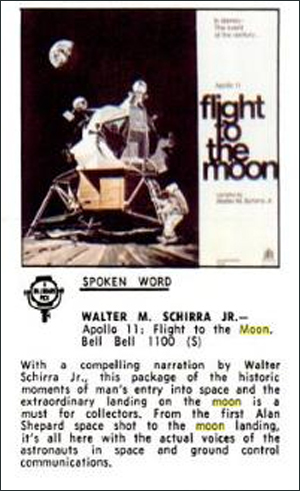 Hear man's first words on the moon. 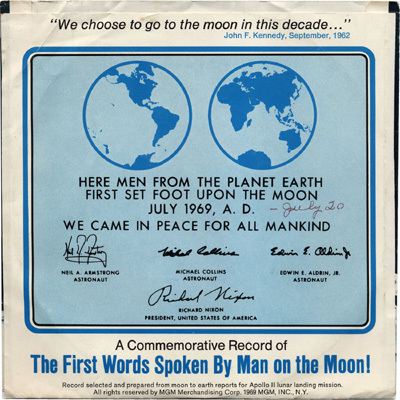 President Nixon's historic telephone call to the astronauts on the moon. 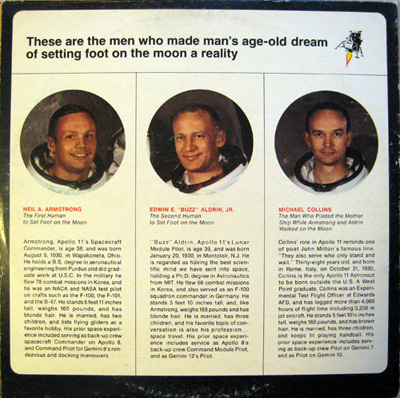 Actual conversations between NASA, Cape Kennedy and Astronauts Neil Armstrong & Buzz Aldrin. 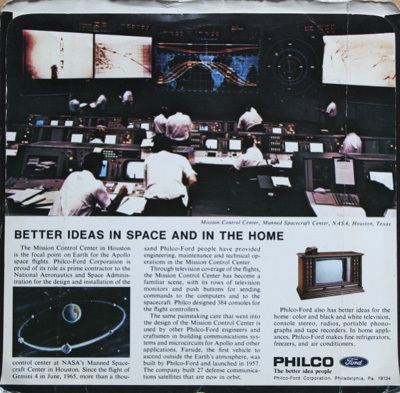 Note: 2-lp set tracing history of NASA compiled by UPI. 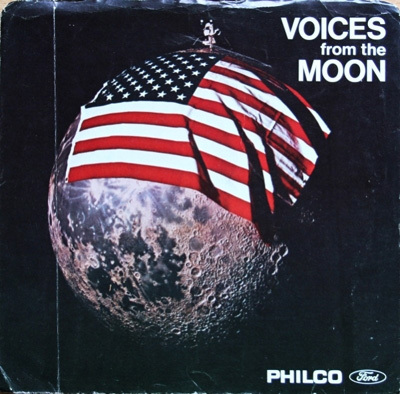 Includes poster of the LM on the moon. which you can't read here, so, download this PDF for the full size version (20x6.5). If you're into the space program, track this one down. 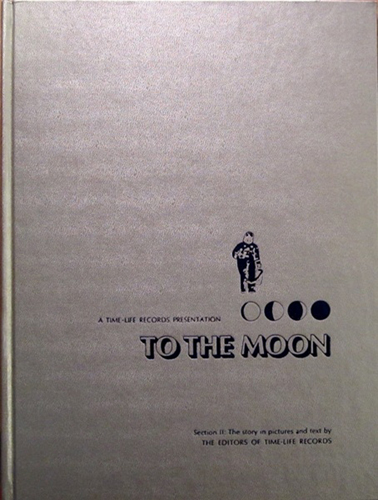 Six-LP set with hard-back book detailing the space program from pre-Mercury to landing on the moon. World War II ends... US seizes remaining V-2s and the German rocket team surrenders to the Americans ... H-bombs for the US and the USSR.... The war in Korea... US space program lags... Sputniks stun the world... The humiliation of Vanguard I and the success of Explorer I. 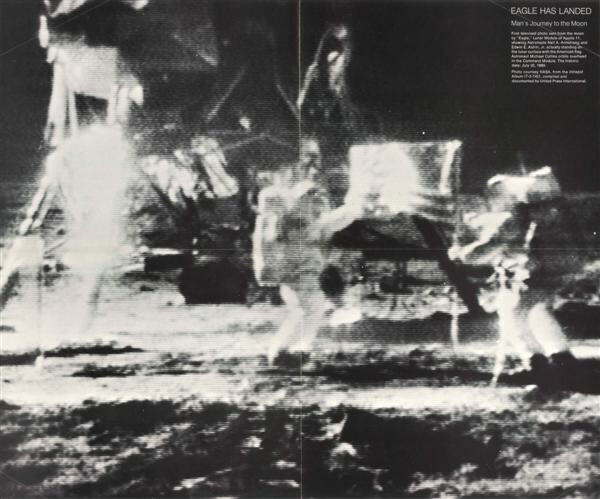 US space probes... Russia photographs the moon with Lunik III... Kennedy President... 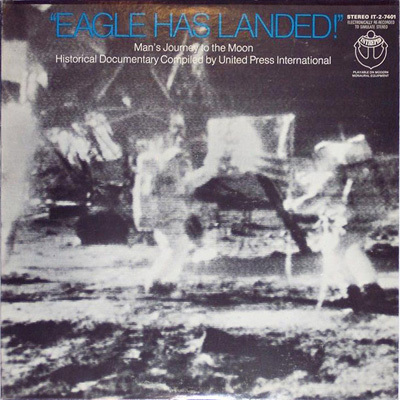 Chimpanzee Ham rides a Mercury capsule... USSR's Gagarin first in orbit... Shepard chosen for first Mercury flight... "Chief Astronaut Jose Jimenez." The flight of Freedom 7. Lunar goal is set. Grissom's Liberty Bell 7 makes a successful flight - and sinks... Rene Carpenter speaks for the wives. Russia's Titov makes 17 orbits. NASA looks ahead to the moon. Chimp Enos orbits. Glenn scheduled for orbit. Friendship 7 "A-OK" with a heatshield dilemma. Glenn addresses Congress. 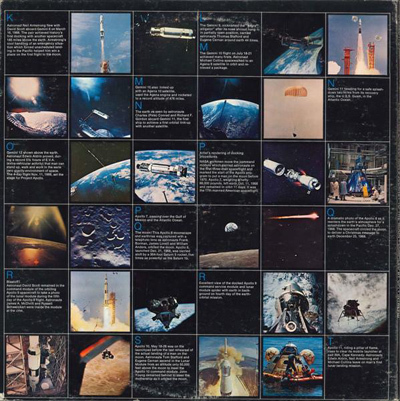 Russi, three-man capsule... Vietnam escalates... A Russian spacewalk... A Titan takes up Grissom and Young... 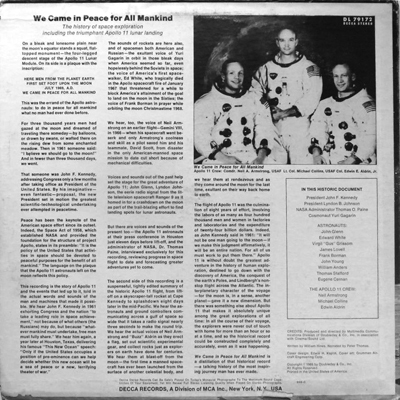 Manned Spacecraft Center established... McDivitt and White: first US spacewalk. Cooper and Conrad: 8 days. Borman and Lovell: 14 days. Schirra and Stafford: the first rendezvous. 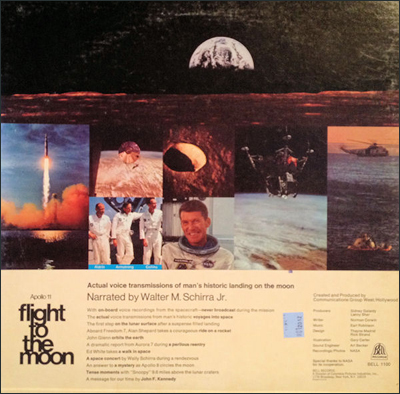 Armstrong and Scott dock with an Agena but tumble end over end and must make an emergency landing... Stafford and Cenrnan find an "angry alligator"... Young and Collins dock with an Agena and use its engine... Conrad and Gordon do a linkup... Lovel and Aldrin prove men can work in space. 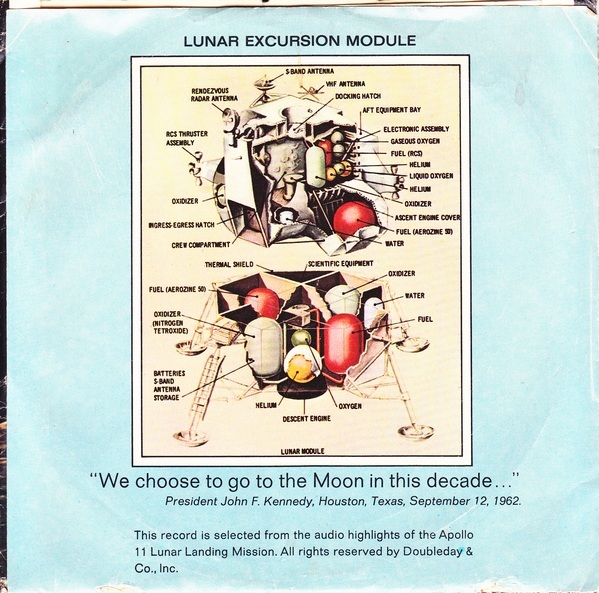 At Cape Kennedy during the long countdown... Liftoff for Armstrong, Aldrin and Collins... Translunar injection...... 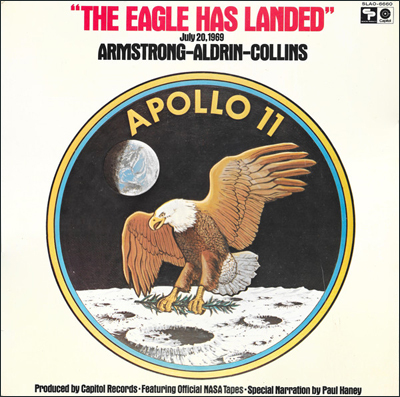 Separation of "Columbia" and "Eagle" in lunar orbit... "Eagle" lands... Armstrong steps down to the surface, and then Aldrin... JFK's goal has been met. 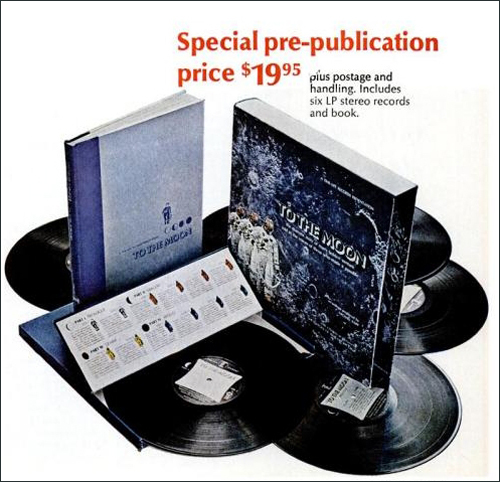 Note: Complete details at Discogs. even reggae groups paid tribute! 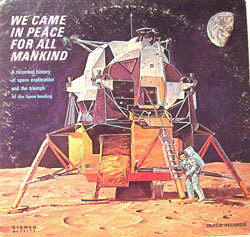 Someday, I'm going to compile a book on the music related to The Space Race. Or maybe a website. I have about a thousand tracks to detail (a little too much for here! ).